Aqua Books, AKA Winnipeg’s Cultural City Hall has started up an indiegogo campaign to help bust through some unexpected red tape and get their doors open again to do what they do best: host fantastic, quirky events across the entire spectrum of the arts. Want author readings, stand up comedy, live radio plays, concerts, puppet shows? You’ll find them at Aqua, hosted in the inimitable style of Kelly Hughes, Mayor of Cultural City Hall. I’ve been a part of two events at Aqua Books, and hope to participate in many more. Aqua’s previous location was host to the very first public reading of my work (trivia buffs take note) when I was an Emerging Writer-in-Residence; it hosted two of my good friends on its live talkshow, Kelly Hughes Live. Countless peers have done readings there. Aqua Books is one of the sponsors of the Michael Van Rooy Award for Genre Fiction as well as supporting local poets with the Aqua Books Lansdowne Prize for Poetry/prix Lansdowne de poésie. Check out their video and please spread the word, there’s really no place quite like Aqua Books. Look what just showed up in my inbox! An easy blog post you say? Why yes, yes indeed. 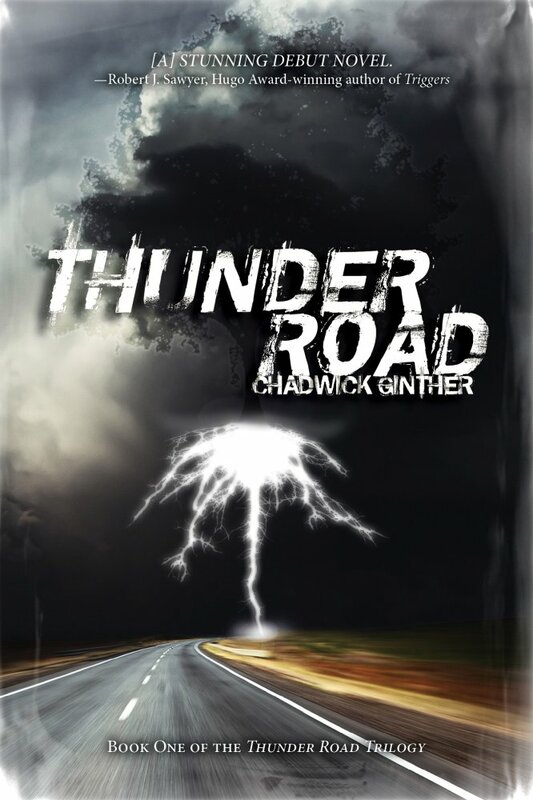 But it’s also the promo poster for the Thunder Road launch. 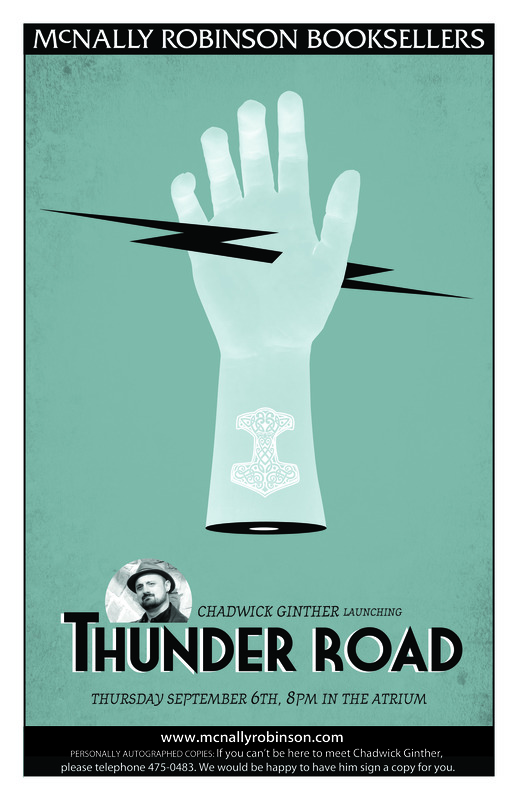 Huge thanks to Joel Schwab for doing the design, the poster looks great. I’m very stoked to see it plastered all over the bookstore. You know, like every surface of the bookstore. Just sayin’. As of this moment, I’m on holidays from bookselling until after my book launch. Of course, when you’re a writer, holidays from the day job usually means typing until your fingers bleed (in between the paroxysms of self-doubt and inevitable bouts of internet time-wastage). I do plan on taking advantage of these dog days of summer, visiting family, playing tennis, etc. but mostly, I’ll be working. For your observing pleasure I’ve decided to post a list of my writing goals for the next couple weeks. I know there is no way in hell all of this will get done. It probably wouldn’t have been possible even when I wasn’t on Twitter or Facebook, but by itemizing every project big and small that is on my to-do list, and most importantly, making it public, I’ll try that extra little bit harder (you know, to avoid the shame (and stink) of failure). Wow. I will be busy, won’t I? I think the title of this post should be self-explanatory. This is the good news I was hinting at some weeks back (which was probably in my last blog post–bad blogger! Bad, lazy blogger!). I feel confident in announcing it now, as my name is up on the website . Oodena, the natural amphitheatre at The Forks, has been a gathering place for centuries. THIN AIR celebrates that history with a collage of commissioned work from writers who have made a mark on the local scene. Gather on the stairs for a magical evening of words in many flavours. Bring a jacket—the air is cool as the sun sets. Oodena is one of my favourite locales in Winnipeg. It just screams story (it’s also where I had my first official author photo taken, thank you Rachel!) and the words “magical evening” tell me I’d better bring my “A” game. Fortunately, I have a whole novel of magical things to choose from to read on the 23rd, one of the benefits of writing fantasy. I’m very excited about this appearance. I attended THIN AIR as a bookseller and reader for several years before I started attending as a writer, so being invited to appear there after the release of my first novel is a real treat. Thank you to the THIN AIR staff: Charlene, Perry, Tavia, Karen, Kate, Bruce, and Kendra for inviting me.